Bank of Sotcher Lake. All images except feature by the author. 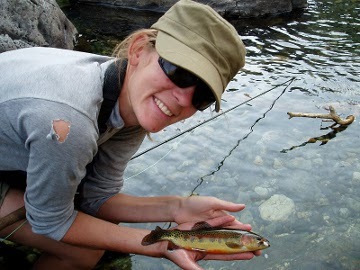 Monica Prelle recounts seven summers working and fishing in the Sierra Nevada. On most mornings at Red’s Meadow Resort near Mammoth Lakes, California, there was a line waiting for me to unlock the door to the cafe. Backpackers, campers and fishermen wanted to get their day started with coffee and a short stack. In the 1800s, land prospectors traveled to the Mammoth area along the French Trail, a route that started in Fresno. Red Sotcher settled in the valley, farming vegetables and selling them to local miners. While settlers came from long distances to mine for gold and silver, it was Sotcher who prospered, the resort and nearby lake eventually being honored with his name. My employee cabin was just forty yards away from the resort’s Mule House Cafe, and for seven summers, I would roll out of bed, get dressed and walk over, usually ten minutes before opening. I would flip the sign to “Open” as customers filled the red pleather seats at the breakfast counter. The thru-hikers often asked which was the best route to Yosemite, and the fishermen asked where the fish were. 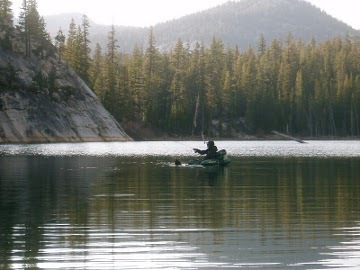 While pouring coffee, I would always describe the John Muir Trail and alternate routes and pointed the fishermen to Sotcher Lake, one of my favorite holes on the San Joaquin River. 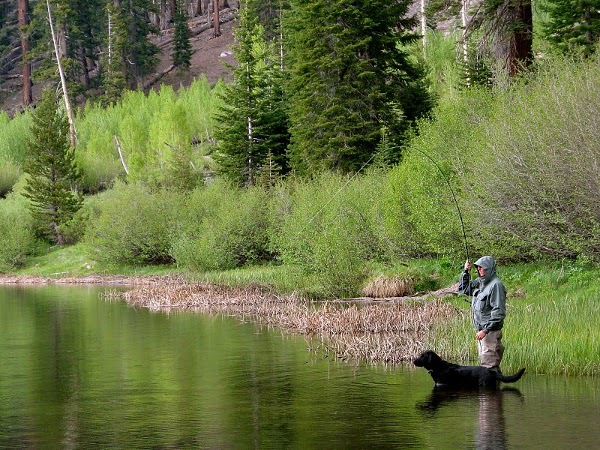 While only six miles of road give access to the river’s campgrounds and trailheads, hiking trails around the river’s Middle Fork, one of my favorite fishing spots, tracked north and south and covered the lesser-frequented sections of wild trout water. 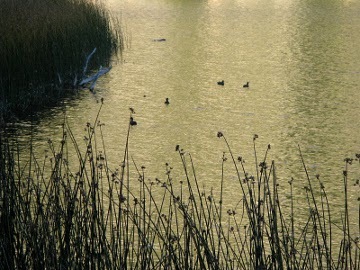 The San Joaquin River was also a place I would explore after work, just for the hour before sunset. On a typical evening, I would set out west of the cafe, cross-country hiking over the John Muir Trail and the Rainbow Falls Trail to a stretch of water that anglers rarely fished. Dusk was often peaceful. Hikers and fisherman were off the trail and home for dinner. The hatch also took off during that time. Fish were feeding a the night’s insects encroached. This was when the valley would settle into the evening’s quietude. 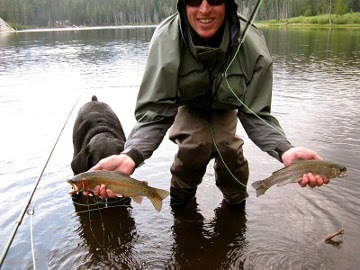 Fly fishing tip: California anglers consider the Middle Fork San Joaquin a favorite for its variety of fishing water. It is a freestone creek, offering pocket water, pools, riffles, runs and flats. 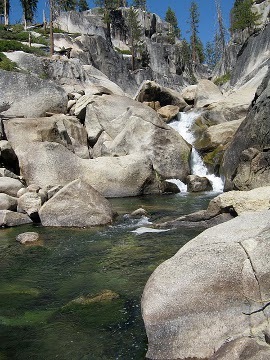 The outlet stream on the eastern end of Thousand Island Lake (9,833 ft) is the headwater for the Middle Fork. Golden Stoneflies are abundant in the area and are a significant food source for trout. Its nymph can be found crawling on rocks in riffle sections throughout the Middle Fork and little yellow stonefly nymph patterns work well on a nymph rig or dropped under a dry fly. You are also likely to encounter caddis, midges and mayflies including blue winged olives, pale morning duns, pale evening duns, march browns and lesser green drakes. One afternoon while I was casting from shore, my husband paddled over to the backbay that I was fishing. His rod bent quickly, the indicator dunking in the lake. He yelled with excitement, but then the line didn’t budge. “You’re hooked on a tree!” I shouted. The rod was bent so far over it almost looked like it was going to break. He held the line tight, in a stand off with what he said with certainty was a fish–a big one. I laughed and watched. It’s got to be a tree, I thought, but eventually the line moved slowly. “See! It’s a fish!” he yelled. Whatever it was, it was strong and fought with its weight. He held the line tight, but the five-weight rod was no match for a fish of that size, and eventually, the line broke. Sotcher Lake is known for its enormous and elusive German brown trout. Sitting at the bottom of the western slope of Mammoth Mountain, the lake was carved out of granite when the glacier that covered the valley receded, leaving a stone basin. A large avalanche path on eastern slope ripped out trees and deposited them into the lake. These large logs covered the bottom of the lake, creating homes for the fish and obstacles for anglers. 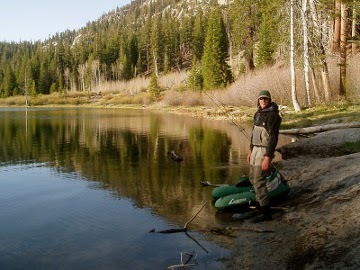 The lake now receives run-off from Mammoth Mountain and the Sierra Crest, and is regularly stocked with trout. The water also holds rainbows and browns that can grow to unknown sizes. These larger fish live in the lake’s depths, in waters that are so deep, no one has ever found the bottom. These larger fish live in the lake’s depths, waters that are so deep, no one has ever found the bottom. But Polaroid photos of fishermen with their catch lined the walls of the store at Red’s, some bleached from years of aging. The photos of ten-pound browns always fascinated me. I now know that they are in there, breaking the lines of the Sierra Nevada’s anglers long before I worked the counter there, and long before the river was even named. Fly fishing tip: Waiting for a fish to bite at Sotcher can make anyone anxious. A slight twitch of the indicator might be a large trout, casually slurping your fly. 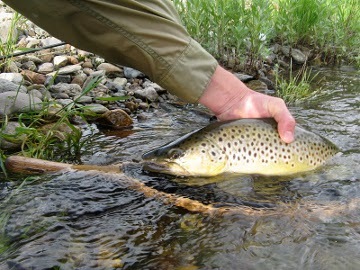 A deep nymphing set-up with midges, damsel and callibaetis patterns are productive in the early morning and evening hours and fishing from a float tube or kayak will be most effective in order to target deeper water. Streamers and wooly buggers can be successful with active fish. If you’re an expert fisherman, maybe you should try your luck on an Alaskan fishing boat. Read Matador’s guide on how to get started.